The Manitoba Arts Council is committed to an approach that respects and recognizes the distinct worldview and creative culture of Indigenous communities, while aiming to make Indigenous artistic expression a source of pride for all Manitobans. 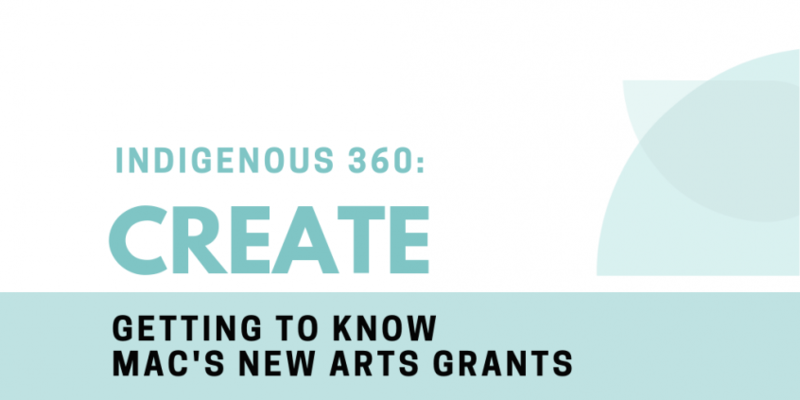 The Manitoba Arts council Indigenous 360 – Create is a new granting initiative that supports professional arts projects at any stage of the creation process. The MAC Indigenous 360 Create program aims to support artistic projects which bring greater visibility to the unique perspectives, realities, voices, and stories of Manitoba Indigenous artists. The Indigenous 360 – Create program supports the creation of new work or development of works in progress in all disciplines by professional Indigenous artists, art groups, and Knowledge Keepers. In order to apply to the Indigenous 360 – Create program, you must be a professional artist, a professional arts group or a Knowledge Keeper. That means you must have a valid profile as an individual or a group on MAC’s Online Application System. To give yourself enough time, make sure that you submit your profile to MAC at least 15 business days before you want to start your application. Previously, creation and presentation activities were eligible in the Indigenous Arts Creative Development program. Now, creation activity and presentation activity will be separated into two programs: Indigenous 360 – Create and Indigenous 360 – Share. The Indigenous 360 – Create program will have two deadlines in a given calendar year. These will stay the same from year to year starting in 2019. The deadlines for the Indigenous 360 Share program are March 25 and September 25. For this year, we are offering a one-time only deadline for Indigenous 360 – Create applications on November 29th, 2018.
have no or limited internet access, have limited or no access to a computer or are not able to make use of a computer in the offices of the Manitoba Arts Council. If you plan on submitting a paper application by mail, the envelope must be sent and post marked on the day of the deadline or earlier. If you are dropping off your paper application, make sure to deliver it during the Manitoba Arts Council’s office hour or use the drop box outside our office from 7 am to 6 pm on weekdays. Knowledge Keepers are now eligible.